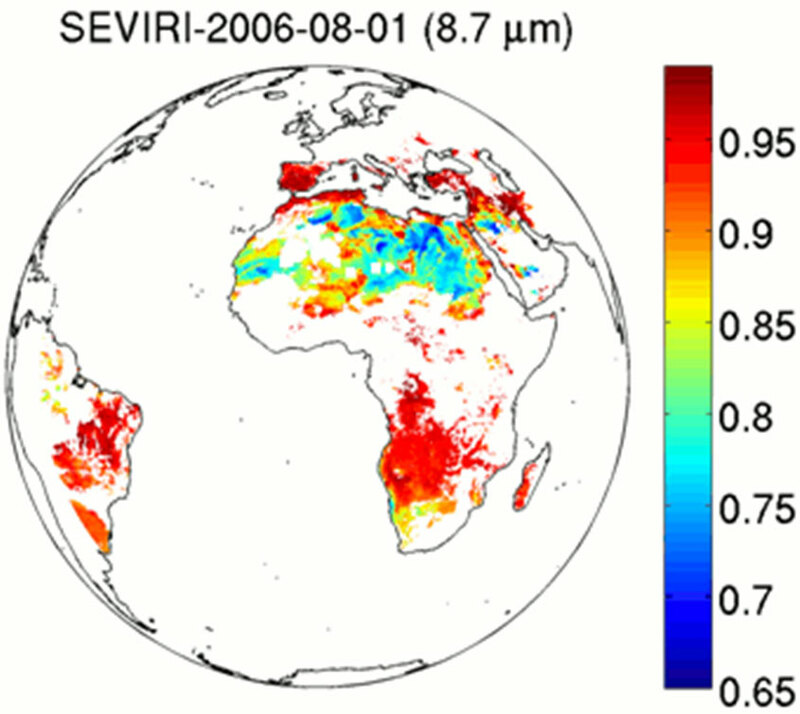 Example of the land surface emissivity product as generated by the GOES-R land surface emissivity algorithm using SEVIRI data on August 1, 2006. The GOES-R land surface emissivity product will be computed for each land pixel deemed to be cloud free. Land surface emissivity is the ratio of the energy radiated by the land surface to energy radiated by a blackbody at the same temperature. The land surface emissivity algorithm will take advantage of high temporal resolution of the ABI measurements to estimate the land surface emissivity by monitoring changes in land surface temperature. The retrieved land surface emissivity will vary from as low as 0.6 to 1 depending on the surface materials, soil moisture, vegetation cover, and surface roughness. The land surface emissivity product will be very useful for the determination of other GOES-R ABI products and will be a very important input for the assimilation of infrared radiances in numerical weather prediction (NWP) models over land.